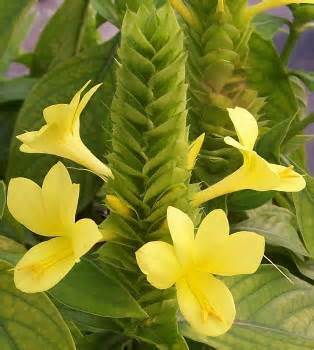 Acanthaceae includes approximately 256 genera of perennial herbs, shrubs, and climbers, which are widely distributed in warm tem- perate an tropical regions. Leaves are in opposite pairs, often at right angles to the pair above and below (decussate) an stems are often 4 – angled. Flowers are bisexual and bi – laterally symmetrical. The sepals and petals are fused at their bases. Upper and lower petals are some- times elongated into lips. Bracts are often more showy than the tu- bular on funnel- shapdd flowers. The fruit in a dry capsule that, in cenrtain species, opens explosively to scatter the seed. The shrubby species described here can be used to create informal nat – ural beds in the English perennial garden style or may be lightly clipped as specimen plants or hedges. Most are suitable for con- tainers. For those that require even moisture, a thick layer of mulch greathly reduces the amount of irri – gation needed. Barleria includes approximately 250 species of shrubs primarily from the Old World tropics. A number of species are commonly culvivated. Flowers are showy and funnel – shaped. Bracts are relatively inconspicuous. Bracteoles and calyx are often spined. Barlerias benefit from light trimming for compact shape. Removing old flower heads encourages repeat flushes of bloom. Southeastern Africa. Evergreen shrub to 4 ft, zones 9-10. Blooms late winter, spring, early summer. Regular moisture when hot, less when cool. Average to fertile, well- drained soil. Full sun. Flowers: trumpet – shaped with flaring lobes, white, opening 1 or 2 at a time, bracts leaflike, green, with silvery hairs, turning blackish with age, in compact spikes. Leaves: ovate, 5-6 in.long, covered with soft, silvery gray hairs. The silvery foliage is a landscaping asset at any time of year, an exceptional foil for deep blue to purple flowers or foliage. Revove old spikes. Prune after blooming. Unusual in cultivation. India, Southeast Asia. Semideciduous shrub to 5 ft, zones 8-11. Blooms spring, fall, or summer in temperate end of range. Regular moisture when hot, less when cool. Fertile, well drained soil. Full to part sun. 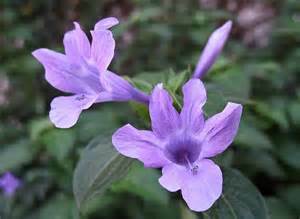 Flowers: trumpet – shaped, blue – violet, pink, or white, throat streaked with white, to 2 in. long, lip 2 – lobed, bracts 2, sharply bristled. Leaves: ovate, to 4 in.long, roughly hairy. This species thrives as a root – hardy perennial along the Gulf Coast. Nematodes tend to limit growth in frost – free parts of Florida. Madagascar, possibly Mautitius, naturalized in the Caribbean. Evergreen shrub to 3 ft, zones 10-11. Blooms warm months. Moderate moisture to fairly dry. Open, well-drained soil. Full to part sun. Flowers: trumpet – shaped, golden- yellow, upper lobes spreading fanlile, bracts shell – shaped, green with red markings and sharp bristles near the base, in ovoid spikes. Leaves: Lanceolate to almost linear, to 4 in. long, midvein pink, margins minutely toothed, with paired spines in the leaf axils. This adaptable and xeric barleria will endure a gardener’s extended vacations. It is salt tolerant to the dunes. Trim after bloom. Synonym: B. micans (misapplied). Southern Mexico to Colombia. Evergreen shrub to about 4 ft, zones 10-11. Blooms intermittently, Primarily fall and winter. Moderate moisture. Average, well – drained soil. Full to part sun. Flowers: trumpet – shaped, lemon – yellow, 4 upper lobes spreading fanlike, lip narrow, bracts flaring, sharply angled and prickled, inflorescence to 12 in. tall. leaves: ovate, 6-12 in. long, hairy, blade tapers down the petiole. Branches tend to sprawl with upturned ends developing into large clumps. This is the only indigenous New World barleria and has been commonly, but mistakenly, referred to as B. micans, a African species not known in cultivation. Synonym; B. querimbensis. South Africa. Evergreen creeping subshrub under 1 ft, zones 9-10. Blooms warm months. Regular moisture to wet. Fertile, well – drained soil. Full sun to bright filtered light. Flowers: funnel – shaped, pinkish orange, lobes to 2 in. wide, bracts inconspicuous, solitary in the leaf axils. Leaves: ovate, to 0.5 in.long, petiole very short. Thrives in fountain – spray or as ground cover. Flowers are dispersed. Almost ever – blooming. Though listed as invasive in Hawaii, it is not known to be a problem in Florida or Puerto Rico.